For the party season, relaxed braids are the perfect compliment to evening wear! 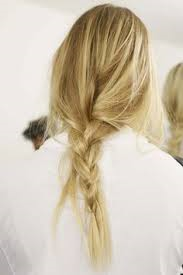 The Messy Braid- lets call it American- is a mixture of European styles but more relaxed and untamed. There are an abundance of these undone styles on the streets and on runways. The models in Erdem’s springs show wore undone braids with lush, elaborate gowns: a formal look offset by the ease of the hair… Some of these are barely even braided braids, as seen at Michael Kors, a style that almost suggested a sort of bedhead look, but paired with dresses and skirts in nostalgic prints. This almost suggests having better things to do than fuss over an exacting up do or sleek blowout. Effortless appeal, however, rarely come without effort. Our stylists will tell you there are products necessary to achieve a perfect messy braid, one that stays just loose enough without unraveling completely. We recommend a base spray or mousse to stop the braid from slipping, a tail comb for the center part, a thin row brush for teasing and hair powder to give a matte finish. Our best advice “try not to think about it too much.” For do it yourself, make an attempt at the braid of your choosing. Go about your busy day. By evening, the messy braid is yours. The "How To's" of hair in your 30's, 40's, 50's and beyond! Get Tickets for Phoenix, AZ - Cast Salon + Spa (B+D).